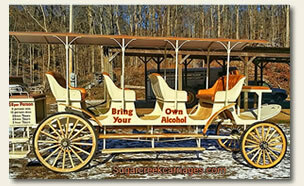 The Surrey is our large capacity carriage for historical and entertainment tours in downtown Nashville. It also can be rented for special events. The regular tours come with a driver who acts as a guide plus a professional music artist who sings and narrates the tour. This carriage seats 15 average sized adults.